Fantastic stunts, fun characters, and a storyline that keeps our interest by switching things up. This is a pretty great action movie. It’s Jackie Chan at his finest, when it comes to contemporary films (drunken master is his best film, but that is more like Hong Kong traditional.) for Rumble in the Bronx, Chan plays Keung, a man who comes to new York, starts working at his uncle’s grocery store in the Bronx, and has to deal with a neighborhood gang and their attacks. There is lots of comedy in this picture with Chan merging humor and action together like nobody else. The plot is great too, with a major switch in enemies and storyline happening between the first and second half. But the main reason why anyone sees this movie is for the action, and Chan is absolutely at his best. He uses props as weapons and gets creative with what he can do, every Chance he gets. The movie reaps the rewards of this and ends up being pretty great. 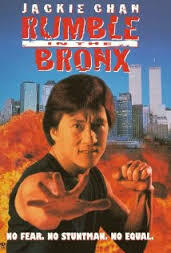 Rumble in the Bronx is the first Jackie Chan movie that played in mainstream theaters in America. It was heavily promoted with TV commercials, as the first Asian megastar in America, since Bruce lee. This is a Hong Kong film that was released in Asia in 1995. 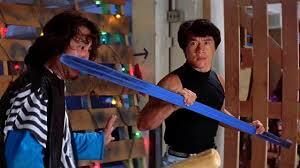 Then in 1996, Jackie Chan became an overnight sensation in the U.S., when this film was released over here. It was a simple matter of that Americans who weren’t as interested in foreign movies, or films they couldn’t see in theaters, just didn’t know who Jackie Chan was. The same can be said of Jet Li and Chow Yun Fat, two actors who followed in Chan’s footsteps, started out as sensations in Asia, before breaking out into movies over here. And Rumble in the Bronx is the movie that started it all. Without Rumble In The Bronx, and without Jackie Chan, there would have been no crouching tiger hidden dragon. Chan is the guy who got people interested, (he’s Also the Asian star who was most successful with breaking into American made films, with his rush hour series doing tremendous business), and Rumble In The Bronx is the movie that started it all. That’s because it’s a very good, and very much to the point kind of movie. At the start of the film, Chan’s character, Keung, has just come to America. He arrives in new York and gets escorted through Manhattan by his uncle. When Keung asks his uncle if the uncle’s grocery store is nearby, the uncle laughs and speaks of how the store is in the Bronx. They go to the store, and Keung starts to help. They go to the uncle’s apartment, and Chan makes himself at home. He also meets a little boy in a wheel chair who lives next door in the building. Back at the store, the uncle sells the place to Elaine. When he is closing the deal with her, in his back office, she sees that there is a one-way mirror that serves as a window to see outside the office, and into the store. Keung walks by carrying things, sees it, and thinks that this is a mirror. He starts doing funny gestures in the mirror such as flexing his muscles and popping a pimple. Only Elaine notices, since she is the one facing the window, and she tries to hide her laughs. This ends up being a pretty funny scene. The action doesn’t get started until after Keung’s uncle has sold the store to Elaine, and Keung has started working for her. He’s in her office one day, and they both see a street punk, named angle, with dyed blonde hair, stealing things. They see it from the one-way mirror, and while Elaine catches Angelo sneaking drinks from bottles before putting them back on the shelves, Keung catches him stuffing food into his jacket. When Angelo is confronted about this at the register, a fight breaks out. Suddenly Angelo has a bunch of friends show up, and Keung kicks all of their butts. The things that is so cool is the way that he goes about it, using anything in his path as a prop or weapon. He uses freezers, supermarket carts, mops, and all kinds of other things. And Keung moves fast. This is more than just cool action. It is also pretty funny stuff. Keung gets himself into such ridiculously tight spots, that you have to laugh. The first half of the movie is a series of fights like this. The one that really started it, even before the grocery shop, had two female bikers drag racing down the street one night. The bikers jumped their bikes onto parked cars and ran onto of one car after another. Each car got destroyed, and when Keung saw this and saw that his uncle’s car was next in line, he jumped in front of the motorcycle and got in the way. This cost Nancy, the female rider, and the race. Between the drag race night incident and the grocery store day incident, these gang members have had enough of Keung, and they start looking for him. When they find him, out on the street one night, they manage to overpower him and drag him into an alley. Keung tries to run away, but it’s a dead end, and he is stuck. The gang members then proceed to use baseball bats and hit bottles at him. Most of the bottles don’t hit Keung, but hit the brick wall behind him, smashing and cracking against the wall, sending pieces of glass flying right at him. He gets pretty messed up and bloody from all this. That leads us to a great scene where Keung goes to the hideout of this gang, and takes them all on at once. It’s a fantastic action scene, where Chan again uses countless props, and the coolest thing about this is that it’s only halfway into the movie. Any other film would have saved this bad guy’s lair scene for its climax. In Rumble In The Bronx, the story is about to get much bigger and new enemies are about to come out. In the second half of the movie a whole new angle is presented, including new bad guys. Suddenly Keung is forced to team up with the gang members in order to stop these more serious guys. It’s a fantastic twist, and completely unexpected. I love the way the story Changes gears, halfway in, giving us double the amount of entertainment that most movies do. And the action stays great the entire way through. The humor can be somewhat corny at times, but that’s the case with all Jackie Chan movies. As far as his brand of martial arts and humor mixed together goes, this is definitely one of his better films.